Lucie Floral Comforter Set . 2" stitch down flange in contrast print on all items. 200-thread-count cotton percale. 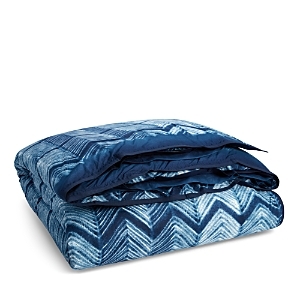 Lucie Ikat Stripe Sheet Set. 200-thread-count cotton percale. Single layer cotton blanket. Decorative pillows and shams Duvet or Comforter and shams in allover printed leaf design inspired by a vintage batik pattern. Sham in faille weave. Decorative pillow with embroidered novelty anchor pattern and French knot accents. Striped sheeting. 200-thread count cotton percale. Single layer jersey knit blanket in vintage sailor stripe pattern. Novelty embroidered anchor detail. Single layer textured knit blanket. Classic silhouette floral with an oversized country stripe on the reverse, in the chambray colorway from the graydon palette. 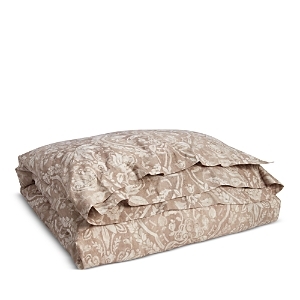 Bowery Duvet Cover and Shams. Smooth sateen duvet cover with contrasting frame and flange. 624-thread-count cotton. 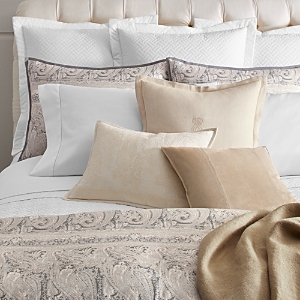 Palmer bedding from Ralph Lauren's Signature Classics collection. 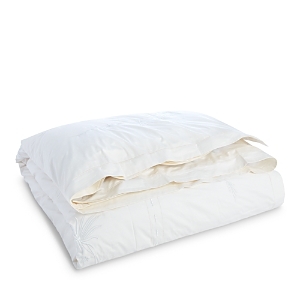 Made of extra-long-staple, crisp cotton percale. Accented with contrast piping. In cotton percale with a bohemian-inspired floral print, the 200-thread-count Phoebe duvet cover and shams are a soft and stylish layer for your bed. Offered in a tranquil cream hue, the Nadiya fitted sheet is the perfect complement to the block prints, stripes, and crocheted lace of the Half Moon Bay Collection. Crocheted lace trim and embroidery add a romantic touch to the bohemian-inspired Nadiya flat sheet and cases. Inspired by an intricate hand-painted tree of life pattern, the Marissa Bedding Collection will bring a relaxing sensation to your space. Vintage-inspired embroidery brings stylish tonal texture to the Katrine sheets, perfectly complementing the bohemian theme. Eyelash fringe and thin stripes decorate the Camellia throw blanket, setting a stylish bohemian tone. 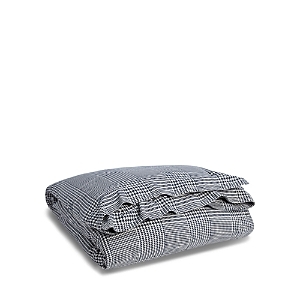 Inspired by a Ralph Lauren menswear knit, the Ariel cotton blanket adds texture and richness to a well-appointed bed. Complement its serene hue with the patterns and tones of the Rue Vaneau bedding collection. Comforter with 0.5" stitch down tailored flange with single pick stitch. 300-thread count cotton sateen. Bar tack quilting. 300 GSM polyester filling. Sham with 2" stitch down tailored flange and single pick stitch. 300-thread count cotton sateen. 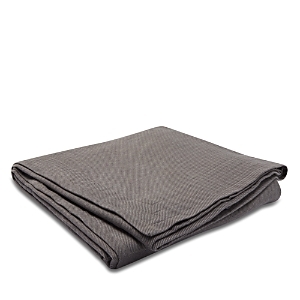 Dobby woven yarn dyed cotton blanket. Meade Sheets RL standard construction, random cut. 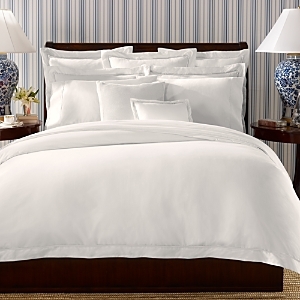 300 thread-count cotton sateen. Decorative pillows and throw Floral print duvet cover and shams. Combed cotton slub. Eaton Sheet has 4" random-cut, stitched cuff. Striped throw with 3" fringe at each end. Made of linen. Decorative pillows A sophisticated paisley print in a palette of soft, tonal greys elevates the look of the Ralph Lauren Mariella bedding collection. The duvet cover, comforter and shams are crafted in smooth cotton sateen, while decorative pillows add luxurious texture with embroidery, linen and suede finishes. Evoking the English countryside, Ralph Lauren's Norwich Road bedding collection features a traditional mix of dapper paisley and vibrant madras plaid complemented by rustic Tussah silk and leather accents. Imbued with an exotic feel of sun-drenched shores, the St. Jean bedding collection from Ralph Lauren features chevron prints and dip-dyed accents in serene sea hues. Inspired by Mediterranean Revival architecture, the Sonoma Valley bedding collection from Ralph Lauren combines rustic linen textures, an earthy stucco palette, beaded details and rich tonal embroidery to create a relaxed yet refined look. Maine's distinguished coastal estates inspire Ralph Lauren's richly layered Islesboro collection, which offers elegant embroidery, luxurious mohair throws, and quilted fabrics in a classic Jacobean pattern. Inspired by the glamour of old Hollywood, the Screening Room bedding collection from Ralph Lauren stars a mix of classic houndstooth and Glen plaid patterns, and sophisticated cameos of luxe leather and silk. Inspired by a chinoiserie pattern of blue chrysanthemums, the Blanc Bleu bedding collection from Ralph Lauren combines a crisp white fret pattern, bold blooms and tonal embroidery for a look of exotic elegance. Inspired by the South of France and adapted for a modern look, the painterly florals of the Isadora bedding collection make this comforter set an effortlessly chic choice for expressing your style. With tonal textural herringbone, this coverlet brings a fresh menswear-inspired twist to the Isadora bedding collection. Decorative pillows and shams Cotton sateen duvet cover and shams with 2" border. 300 thread count. Quilted jacquard coverlet. Create an instantly inviting bedroom with this comforter and pair of shams, each featuring watercolor-inspired florals in serene blue and white hues. Cotton sateen ensures that the set is as soft as it is alluring. Quilted jacquard coverlet. Yarn-dyed polyester/cotton. Four-piece sheet set includes flat and fitted sheets and two pillowcases. 475-thread-count cotton sateen. Pleating detail on flat sheet and pillowcases. With its hand-drawn sensibility, this reversible comforter's sophisticated floral print brings a relaxed, instantly inviting look to your space. Made from breathable cotton percale that gets softer with each wash, the Marabella comforter features hydrangeas and primroses at one side, while an oversize picnic blanket gingham is printed at the back, creating two different looks inspired by summer. Inspired by a French Provincial design, the Liana floral comforter presents a botanical pattern on breathable cotton percale that is designed to help you keep cool through the night. Its double-needle topstitch lends a textural accent. Woven from soft, breathable 200-thread-count cotton percale, the colorful floral pattern of the Sophie bedding collection from Lauren Ralph Lauren will add whimsical cheer to your bedroom. Romantic floral imagery is framed by deep borders in the Lucie floral comforter. Traditional Indian block printing inspires this inviting bedroom look. Lauren Ralph Lauren Home striped comforter and shams. 144 thread count quilt in cotton mélange. Sheet set and decorative pillows coordinate. 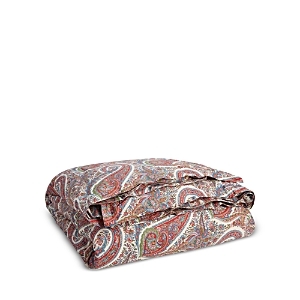 Inspired by fabrics from the southern French region of Provence, this comforter features indienne paisley with wide decorative borders. Its reversible design offers maximum versatility, with the bottom side featuring a classic basket-weave print. Inspired by geometric yachting stripes, the Casey stripe comforter features broad navy-and-cream stripes on its face with a narrower pinstripe pattern lending a textural look. The reverse side adds a more subtle look with pinstripes on a pure cream background. Made from soft slub cotton fabric, the Willa duvet features an understated floral print that reverses to a stripe pattern, making it easy to match with any bedding. Create an instantly inviting bedroom with a choice of a duvet cover or comforter and pair of shams, each featuring watercolor-inspired florals in serene blue and white hues. Cotton sateen ensures that the set is as soft as it is alluring. The Lauren Ralph Lauren Devon Bedding Collection offers two distinct looks in one with its reversible duvet covers and comforters—variegated stripes and a painterly botanical pattern in a neutral color palette set the stage for relaxation and casual comfort The Marley bedding collection from Lauren Ralph Lauren creates a vibrant space with colorful paisley medallions inspired by traditional South Asian patterns, classic ticking stripes and ikat tie-dye prints in pink and sky-blue tones. Lauren Ralph Lauren Home introduces the Graydon Bedding Collection, an array of versatile essentials that focuses on casual comfort by offering soft fabrics that get better with every wash. Neutral hues make these pieces easy to build upon, providing the foundation for a well-rounded, fully stocked linen closet. A paisley pattern inspired by an Indian hand-blocking technique is balanced by clean lines and light hues, defining the fresh artisanal-chic sensibility of the Nora bedding collection from Lauren Ralph Lauren From a classic windowpane pattern to menswear-inspired herringbone, the Dorian bedding collection from Lauren Ralph Lauren expresses timeless sensibility with neutral hues and cozy texture to transform your bedroom into a restful haven. Bold jacquard weaves and textured knits combine for a modern take on southwestern style with textural highlights that give the Taylor bedding collection from Lauren Ralph Lauren heightened tactile appeal. A classic patchwork print that reverses to checkerboard gives the Kyle comforter set from Lauren Ralph Lauren a homespun Americana look. Featuring the soft feel of 200-thread count cotton percale, each set comes with a comforter and two shams. 464-thread count. 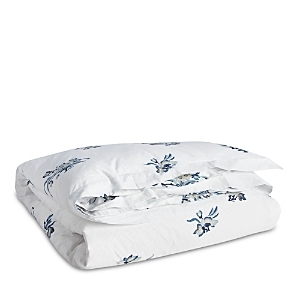 Cotton Made of 800-thread-count, silky-smooth cotton sateen. Available in an array of color choices. From Ralph Lauren's Signature Classics collection. 624-thread-count cotton sateen bedding with hemstitch detail. In White, Ivory, Vintage Silver, or Polished Bronze. Select pieces may be monogrammed, if desired. Sheets from Ralph Lauren's Signature Classics collection. 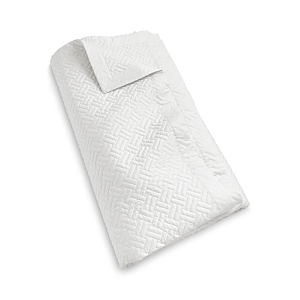 464-thread-count Egyptian-cotton percale with a tight, uniform weave that results in a smooth, crisp feel and matte look. Optional personalization available. Machine wash. 4" self hem with double needle topstitch. LRL standard construction. Cotton percale. A brushed finish lends luxurious softness to this season-spanning cotton twill blanket from Ralph Lauren, in a neutral hue that easily complements a variety of motifs and colors. The Greenwich collection's subtle geometric design makes it ideal for luxe layering. Its plush quilting and 300-thread-count sateen will pair marvelously with Ralph Lauren's Bowery bedding. Mirrored forms suggestive of shimmering tapered horizons interlock across the hand-knotted wool and silk pile of Ayumi. A refined contrast of tone and texture accentuates the emphasis on interpreted shape and form throughout the lush, dense weave of this urban-chic area rug. Oyster A dense, flecked surface precisely conveys the stylistic deviation in color and design of Longtrail. The inherent qualities of chunky hand-woven pure wool are well showcased with soft, comforting textures taking precedence over color and pattern. A trimmed fringe on either side adds a country-casual aesthetic broadening the decorative choices afforded by Longtrail. Taupe The aerial image of a prodigious cityscape inspires the symmetrical composition of angular shapes and linear boundaries exhibited in Deco Bas. This expressive urban grid design takes on comforting qualities in the hand-knotted wool and shimmering viscose cut pile while the interplay of geometric forms makes for an enthralling visual display of transitional tension.